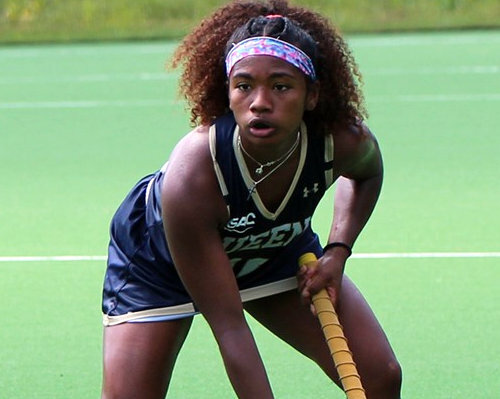 After edging Bellarmine University, 5-4, at home earlier in the season, Maha Clarke and her Queens University of Charlotte Field Hockey teammates fell 3-2 in double overtime to the Bellarmine. Queens now sits 7-6 on the year after dropping the nonconference game, while Bellarmine improves to 7-8. After Queens jumped out to a 2-1 lead in the opening half of play, Bellarmine was able to knot the game in the second half and send the match into overtime. They then scored in the 83rd minute to force the split in the home-and-home series. Maya Forbes would score the first goal of the game in the 21st minute, but Mandi Isom of Bellarmine soon answered to equalize the match at 1-1. Mazvita Mtisi's goal would come in 31st off of a Penalty corner, and the Royals went on to take the 2-1 lead into the halftime break. Queens was held to just three shots in the second half as Bellarmine totaled eight. One of the Bellarmine shots would slip past Queens' Lanie Walsh off the stick of Mandi Isom, knotting the game at 2-2 in the 59th minute. The game remained tied until the end of regulation forcing overtime where Bellarmine's Lindsey Reynolds scored the game-winner.